Avalon Mall (Kenmount Road at Thorburn) offer more than 127 brand name stores. Avalon Mall (Kenmount Road at Thorburn) is located in St. John's, Newfoundland and Labrador - 48 Kenmount Road, St. John's, NL, A1B 1W3 (GPS: 47.561324, -52.75418). Look at the list of stores in Avalon Mall (Kenmount Road at Thorburn), hours, location and information about mall and special events, sales, coupons. You can choose store from list below and get detail information - other stores locations for the brand, location, shopping hours, phone, map, directions contact. Avalon Mall (Kenmount Road at Thorburn) is one of the best shopping place for spend your free time - mall/shopping center has all types of stores - outlets, department, fashion, traditional and more. Have you ever visited Avalon Mall (Kenmount Road at Thorburn)? Do not forget to write shopping review and rate your satisfaction. Avalon Mall is an indoor Canadian shopping mall, which is located in St. John’s, Newfoundland and Labrador on Kenmount Road. The mall was opened in 1967 and is owned by Crombie REIT. Avalon Mall is the largest shopping centre in Newfoundland and Labrador. For Newfoundlanders and Labradorians is Avalon Mall known as „The Mall“. The large of the mall is over 500 000 square feet, two floors and offers over 140 stores and services to choose from. There are from trendy fashion boutiques, states-of-the-art cinemas, and largest food court in the Atlantic Canada, to uncompressed amenities, including family washrooms, nursing rooms, and children’s play area and so on. Here are some examples of offering shops: Aéropostale, Alian N Tan Jay, Bench, Danier Leather, Bluenotes, Ardene, Eclipse, Gap, Intersport, La Senza, Roots, Samuel & Co., Urban planet, West 49, Pseudio, Foot Locker, Aldo, Bell Aliant, Telus Mobility, HMV music, Claire’s, Sunglass Hut, Globo and so more. 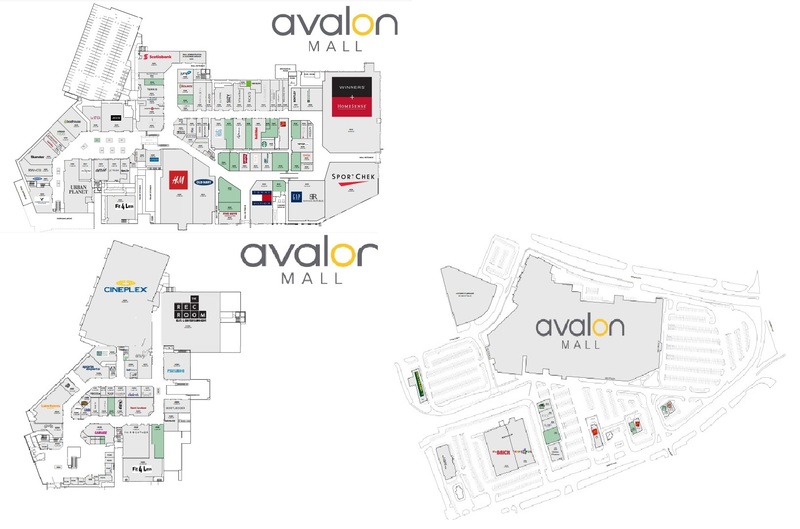 The anchor stores of Avalon Mall are: Cineplex Cinemas and IMAX, Sears, Winners HomeSense. Avalon Mall has plenty of spaces for parking, there are over 2 900 parking spaces including several handicap and expectant mother spaces. Avalon Mall (Kenmount Road at Thorburn) - St. John's Area, Newfoundland and Labrador A1B 1W3. Click on the button and get directions to Avalon Mall (Kenmount Road at Thorburn). Mall/Shopping center is also displayed on the map with gps for your navigation. Avalon Mall is the largest shopping mall in no. It has close to 200 shops not 39. Give us your experience with Avalon Mall (Kenmount Road at Thorburn) by writing a short review.